Shelby Jean Moser, 82, of Mt. Pleasant, Arkansas departed this life on October 8, 2018. She was raised in Guion and lived her adult life in Mt. Pleasant. She was a wife, mother, grandmother, and great-grandmother. She was richly blessed by God during her life. 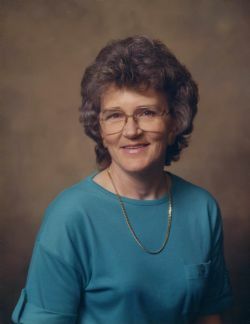 She is survived by her sons, Bobby Keith Moser and Kennard �Kenny� Dean Moser; grandchildren, Elizabeth Claire Mickle, Jennifer Jean Mathews, Laura Leigh Moser, Jonathan Dean Moser, Katelyn Ann Moser, Kaleb Alexander Moser (spouses of grandchildren thought of by her as additional grandchildren are Clinton �Clint� Wayne Mickle, Laura Kathryn Moser, and Kyle Robert Mathews); great-grandchildren, Fisher Caine Mickle, Avery Elizabeth Mickle, Heidi Kathryn Moser, Jack Dean Moser; sister, Jackie Johnson of Houston, Texas; sister-in-law, Nell Lesan; along with numerous nephews, nieces, cousins, and friends. She was preceded in death by her husband, Bobby Dean Moser; brother, Robert Lesan; brother-in-law, Bill Johnson; and her parents. Pallbearers will be Joey Bray, Tim Edwards, Donnie Fulbright, Duane Johnson, Eddie Tate and Winford Winkle. Services will be held at the Roller-Crouch Funeral Home in Melbourne, AR on Monday, October 15, 2018 at 2:00 p.m. with Brother Gerald Coleman officiating. Casual attire is suitable. Visitation will begin at 1:00 p.m. prior to the service. Click Play below to view the Video Memorial for Shelby Jean Moser. If you would like to order a DVD copy of the video, please contact the funeral home at 870-368-4540.